PTFE has a coefficient of friction that is one of the lowest of any material ,between 0.05 and 0.09. PTFE also is extremely corrosion resistant, especially to acids ,harsh inorganic and organic chemicals, it is attacked only by the alkaline metals in the elementary state ,by Chlorine trifluoride and by elementary Fluorine at high temperature and pressures. In addition, PTFE can withstand a wide of temperatures, from 260℃ down to -180℃. The extraordinary characteristics of PTFE makes it the ideal choice in a wide range of applications, such as chemicals, petrochemicals, fertilizers, agrochemicals, dyestuff, textile, paper, clothing, building, food processing plants and valves industries. 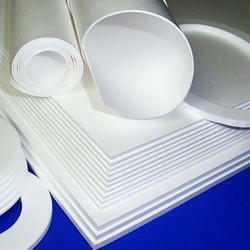 i) PTFE Skive sheet ,thickness 0.2mm to 3mm , width 2000mm max. ii)PTFE molded sheet ,thickness 3mm to 100mm, max. dimension 1500mm*1500mm.